Cook the potatoes in a pressure cooker with two cups of water. The moment pressure is formed, reduce the heat to low flame for 5 minutes, switch off the stove. Let the cooker cool to room temperature, open the lid take out the potatoes, peel and cut the potatoes into small cubes and Keep aside. Heat the oil or ghee in a wok /kadahi/ pan add the cumin seeds, when it starts spluttering, add asafetida. Fry for few seconds till asafetida turns light pink, add ginger and chili, turmeric, clove, coriander powder, sauté for one or two minutes more. 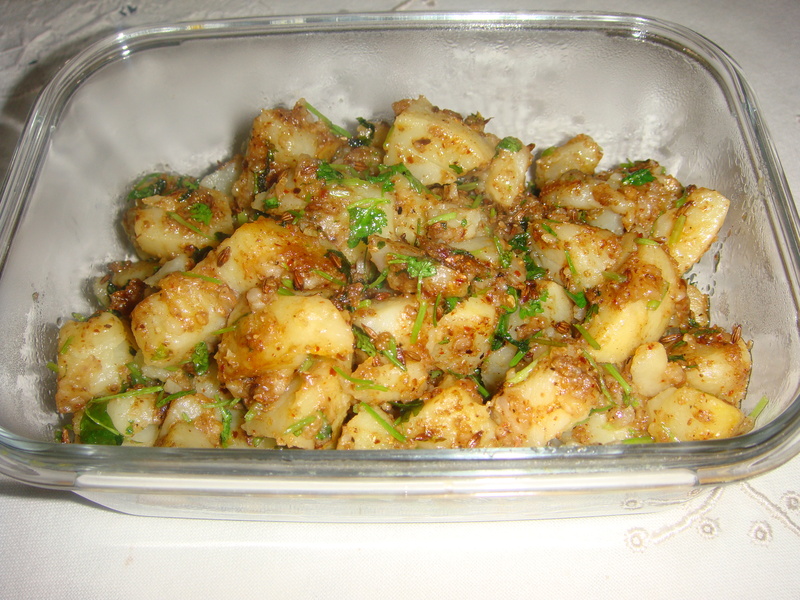 Add cubed potatoes, salt, raw mango powder to the fried masala. Mix well, cook for few minutes till the masala is well blended with potatoes. Garnish with the chopped coriander leaves and serve hot with Puris and other Indian breads. Note:The sookhe aloo can be cooked in many different ways. So many recipes are there to choose from. The potato skin is a concentrated source of dietary fiber, so to get the most nutritional value from this vegetable, don’t peel it and consume both the flesh and the skin. Just scrub the potato under cold running water right before cooking and then remove any deep eyes or bruises with a paring knife. If you must peel it, do so carefully with a vegetable peeler, only removing a thin layer of the skin and therefore retaining the nutrients that lie just below the skin. Potatoes should be cleaned and cut right before cooking in order to avoid the discoloration that occurs with exposure to air. If you cannot cook them immediately after cutting, place them in a bowl of cold water to which you have added a little bit of lemon juice, as this will prevent their flesh from darkening and will also help to maintain their shape during cooking. As potatoes are also sensitive to certain metals that may cause them to discolor, avoid cooking them in iron or aluminum pots or using a carbon steel knife to cut them. Potatoes are a very good source of vitamin B6 and a good source of potassium, copper, vitamin C, manganese, phosphorus, niacin, dietary fiber, and pantothenic acid. For an in-depth nutritional profile click here: Potato.